How do you create outerwear that protects officers from the elements in all types of precipitation, in both low and high temperatures, and provides access to gear when wearing an external carrier? Flying Cross solved this riddle with its DutyGuard HT Pullover. To develop this new duty jacket, Flying Cross team members spent a lot of time speaking with law enforcement officers in different regions to suss out how their ideal outerwear would fit and function. One major concern informed the Dutyguard HT Pullover's design. "What we found in our product development meetings was that officers were looking for an outerwear piece that was compatible with external carriers," says Anthony Talbert, associate marketing manager, Flying Cross. 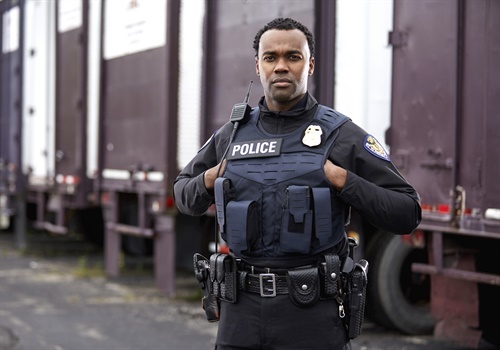 In discussions with officers, Talbert and his team found that wearing ballistic vest carriers over their uniforms has become more common, and officers were concerned about accessing their myriad gear attached to the carrier. "This jacket offers unencumbered access to external gear because it's fully compatible with over-the-body, external armor," says Talbert. The carrier fits over the top of the pullover. He says officers can wear the garment over their waistline, or can tuck it into their waistband and underneath the external carrier. Either way, the jacket is designed so it won't impede access to gear. The "HT" in the DutyGuard HT Pullover stands for hybrid technology. To make the jacket comfortable to wear under armor, the torso is made of knit stretch performance fabric that won't bunch, while the shoulder and chest area are made of a breathable waterproof shell fabric. But the entire garment is made using a special technology to maintain the officer's ideal body temperature. While very warm when it needs to be, this jacket is not going to heat your body up when you move from cool to warm environments, Talbert says. Officers tend to take layers off when they go inside so they don't get too hot, but that's not necessary with this jacket because of its VaporCore, powered by 37.5 Active Particle Technology. It doesn't just wick away moisture. It responds to the wearer's body heat to keep relative humidity at 37.5% and core body temperature at the ideal 37.5 degrees Celsius, even under body armor. The Dutyguard HT Pullover jacket can be worn as a standalone jacket, without a carrier worn over it. Its sleek quarter-zip design looks stylish and makes the jacket easy to take on and off. It also pairs well with other products in the Flying Cross Layertech outerwear line, which consists of three liners and two outershells. Notable features include gusseted underarms on both sides for functionality and mobility, articulated elbows for range of motion, raglan sleeve design that doesn’t restrain movement, and low-profile stretch cuffs for fit and comfort. But one feature that really stands out to the officers who have worn the Dutyguard HT Pullover is its hand warmer pockets, which are positioned just so. "Officers on duty in cooler climates will place their hands on their chests under their carrier to keep their hands warm, so this is similar," says Talbert. "The fleece-lined pockets are comfy and easy to move their hands in and out of." The jacket is available in LAPD navy and black for a retail price of $162. Officers can contact their local dealer for law enforcement discounts. "The Dutyguard HT Pullover jacket is an example of Flying Cross attempting to serve the law enforcement community through innovation," says Talbert. "No other outerwear piece is going to protect you from the elements and be fully compatible with and designed to be worn with an external carrier."